Admittedly, our visit to Paris was not all rainbows and sunshine. First trimester nausea, a hotel in a not-so-great part of town, and sticker shock were just a few reasons why our weekend in the City of Light does not rank among our more favorite travel experiences. And then there was the Sacré-Cœur Basilica. The Basilica of the Sacred Heart is just barely 100 years old and commands an amazing view of Paris on the Montemartre, particularly for watching the sun set. From what we could see in our guide books prior to our arrival, there were a few grassy areas where we could spread a blanket and enjoy a romantic evening with a picnic dinner. It's really too bad that reality didn't match our expectations. First of all, the climb to the top was unpleasant, and I'm not referring to the incline. There were hordes of tourists all trying to do the same thing we were, and to compound the problem, there were what I could only describe as gangs of young men aggressively hawking their wares. And by hawking, I should say harassing, verbally assaulting, and intimidating anyone they singled out. They attempted to forcibly put a bracelet on my friend's arm, then stormed after her shouting and screaming for her to buy their trinket when she refused. He chased us up the final set of steps to the Sacré-Cœur, and it wasn't until the crowds closed behind us that we finally were free. It was angering and also alarming. Secondly, there was the atmosphere of the Sacré-Cœur itself. My oh my, it is a beautiful building! But... the inside of the basilica felt more like a market than a church. There were machines selling commemorative stamped coins strategically spaced throughout the structure. Despite the signs to keep quiet and to take no photos, it was noisy and full of flash photography. It was a far cry from our experience in the Notre-Dame, which despite the hundreds of tourists lined up to view it, had a more solemn and spiritual feel. But that is just my opinion! And despite the downsides, I am glad that we experienced it for ourselves. View of Paris (and the hordes) from the Sacré-Cœur. 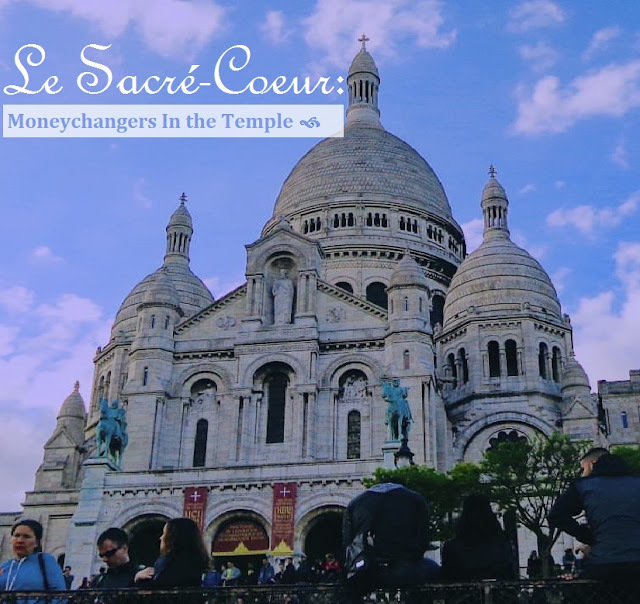 Have you visited the Sacré-Cœur Basilica? Sorry to hear that your experience wasn't the best. I have similar feelings about overly touristy places. I actually felt very similarly when visiting Paris as well (aside from the pregnancy nausea:P) I know touristy places are that way for a reason, but it really can take away from the experience. Hope not all of Paris's sights were a disappointment!